In the beginning – OrrWhat? However, that’s not what this post is about – at least not directly. It is about creation though. Over the years there have been a few books which have been ‘eureka moments’ for me. They’ve helped illuminate some aspect of theology or biblical interpretation with which I’d been struggling. Either just not ‘getting it’ or having difficulty fitting it into the rest of my theological outlook. Sometimes it has meant re-assessing large parts of that theology, then re-shaping it through new understanding. Other times it has been like a missing jigsaw part turning up and suddenly having the big picture make a bit more sense. 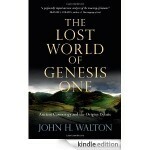 One of those books is one I have just finished reading: The Lost World of Genesis One by John H. Walton. For me, this was one of those ‘game changer’ books, opening up a new way of looking at, and understanding the contentious opening chapter of the Bible. I’ve never been happy with taking the opening chapters of Genesis ‘literally’ – seven, 24-hour periods, supernatural creation of flora and fauna, and so on. Regardless of a young-earth or old-earth outlook, it flies in the face of scientific discovery. It has the underlying issues of ex nihilo (out of nothing) or from pre-existing ‘chaos’. It raises issues over the place and purpose of humanity. And it seems to me that three main camps form. The literalist view, with its associated extremes of YEC (young earth creationism), and humans riding around on domesticated dinosaurs and disputes over fossil records and carbon dating. Or there’s the metaphorical approach which also covers a whole range of interpretations, from days = ages, to it’s all just poetry with no real meaning as such. And then there is, I think, a third camp which simply avoids the whole thing and doesn’t want to open that can of worms, but frowns on YEC and wishes those who espouse it would just go away. Walton’s book offers, I believe, a way forward in holding together the tension of taking the words seriously and avoiding conflict with the scientific establishment. His fundamental premise is that the opening sections of Genesis do not offer us a material ontology, but a functional ontology. In other words, they do not describe how everything came to be in physical/scientific/material terms, but in terms of purpose/function/place. Anyone who has studied the Bible seriously (and so been exposed to better commentaries) cannot be unaware of other ancient creation ‘myths’. Sometimes Genesis is even cast against these; used as a way of contrasting God with the gods of other ancient religions, and their violent creative activity and their making of humanity to serve them. 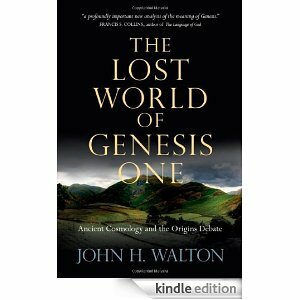 Walton draws heavily on these writings, as well as an in-depth study of key Hebrew words, to show that Genesis is not a scientific text describing material creation, but rather text describing the giving of ‘functions’ by God. He uses an analogy of a college campus (and like all analogies, it only holds up for so long). The buildings and infrastructure do not make it a college. Only when it is a place of learning is it a college. In assuming its function it comes into being. This is the basis for his treatment of the opening parts of Genesis. Furthermore, beyond this presentation of a functional ontology, Walton sees the creation narrative as an echo (or precursor) of the establishment of the Temple. This is a text about God establishing his temple on earth, and taking up residence (and thereby giving it its final purpose and ‘being’). Walton’s arguments are not new, but I do believe that he gives us a ‘mature’ presentation of them, robust enough to withstand scrutiny and to be, for me anyway, compelling. His approach allows him to critique many of the current presentations of creation theology, and to address many of the issues they throw up. He offers this summary towards the end of the book, and I present it now. The book is definitely worth a read and it is also worth searching out Walton’s many other writings and presentation to be found on the web. The Hebrew word translated “create” (bara) concerns assigning functions. The account begins in verse 2 with no functions (rather than with no material). The first three days pertain to the three major functions of life: time, weather, food. Days four to six pertain to functionaries in the cosmos being assigned their roles and spheres. The recurring comment that “it is good” refers to functionality (relative to people). The temple aspect is evident in the climax of day seven when God rests-an activity in a temple. When discussing our faith with skeptics, we need not fear the science discussion. We can relax and respond to any proposal they make with, “Yes, but there is no reason God could not have been involved in that process.” The supposed conflict between science and faith is often simply a misunderstanding. There is, in fact, evidence that the conflict was promoted from the science side before it was ever taken up from the faith side. A second advantage is that by holding the cosmic temple inauguration view of Genesis and the teleological evolution view of material origins we may be able to curb the constant attrition of faith that takes place as students interested in science have been told that they have to choose between science and faith. Such a choice is not necessary. A third advantage is that we may begin refocusing our concerns about public education. Rather than trying to push the agenda that young-earth creationism or Intelligent Design needs to be taught in the schools, we can focus on demanding that metaphysical naturalism, a matter of belief rather than science, not be bundled together with the teaching of evolution. We can call schools, teachers and textbook publishers to account for the ways that they insert dysteleology (which is not science, but belief) into the curriculum. Furthermore public education should be interested in teaching evolution with all of its warts and problems, and not overstating the case. I found Walton’s arguments compelling and his approach helpful, especially when attempting to reconcile a scientific worldview with a Christian faith. He allows them to sit side-by-side with minimum conflict, ensuring that theology and biblical understanding does not have to be ‘watered down’ (an issue I have with many ‘God of the gaps’ ways of reconciling the two). I also think that there are implications for our ‘bigger picture’, especially if we do treat this as a ‘temple inauguration’ text. What then is our view of creation, and our place within it? I think it is a good fit with my musings and approach for an inaugurated eschatology, but some more thinking on that is required. In the meantime, let me encourage you to read the book, or at least explore a but more of Walton’s writings. You state above that there are three views, the literalist view, the metaphorical approach or a third camp which simply avoids the whole thing. I would disagree with you on this and several other points. My own view, and I speak as one who has studied theology and has had access to better commentaries, is that the Creation account in the Bible is true but that the views of young creationists and the like are wrong. It has been posited that the Creation happened in eternity rather than in time. That when God created the universe and everything in it time had not yet been created. Reading the texts supports this theory especially if we examine exactly how long Adam lived in the garden. If we accept that he was created outside of time then he could have lived there for millions of years. We only know how long he lived after he left the garden. I hope this theory gives pause for thought. Alan, thanks for taking the time to comment. The three views weren’t entirely serious; just a sweeping statement to make the point that, there’s a pretty broad approach to these texts (including avoiding them). Thank you too for your thoughts on an another approach. I would probably have broadly agreed with you until recently, but always with the niggling feeling that such an explanation was a way round the texts rather than being true to them. I don’t deny that they could support your perspective, but I think that we are then attempting to read back into them something that helps us to reconcile the issues. Following Walton’s arguments allows for the text to be better understood in their own context, not in ours, and, as such, I think offers a better integrity to the texts. Even if you don’t read it in its entirety, it’s probably worth downloading the Kindle sample to get a flavour of his thesis. Great to see you’re blogging again !! I was glad to see that your definitions of reading the creation story were nor entirely serious… the bit about riding domesticated dinosaurs I found rather silly !! Haven’t had a laugh out loud moment on theology for a while ! Like you, I’ve never been comfortable with the literal seven day explanation and argued strongly against this when a beach mission leader said that we all (the team) believed that ! I’ve always tended towards treating chapter two and following as a story about how things began from the human point of view, while chapter one was more from God’s perspective. I’ve never seen creation as a battle ground between science and religion because, for me, the disciplines ask completely different questions. Science the How ? Religion the Why ? This isn’t a new argument either, but I can live with it.